Parenting with Cancer: What’s the first thing you thought of when you were diagnosed? Ellie Schoenberger: My kids. I thought, almost instantly, that I could be okay with my own mortality but I wanted to make it for them, and my husband. I didn’t feel fear, interestingly, but more like confusion. Like – cancer? What? ME? I’m 43! PWC: How did you tell the kids you had cancer? If you didn’t tell them, why not? ES: We were always very open with them, especially my daughter. It helped that I had a good prognosis, but we didn’t really talk about my situation, other than to say the doctors thought the medicine would work. We also explained that cancer is associated with dying — indeed my daughter knew kids in her class who had grandparents who had died of cancer –- but that it didn’t mean that every time. That medicines these days were treating many, many people successfully. We also told them that the sicker I looked, the better I was getting, because the medicine makes you feel sick as it kills the cancer. We wanted them to be prepared for whatever happened to me physically. We even brought them into the hospital where I was receiving treatment (radiation and chemotherapy) because it was a serene, beautiful environment and I knew whatever they were picturing in their heads was much worse. I didn’t let them see me get treatment, and I worked out a time with the nurses when it wouldn’t be too crowded or upsetting to be there, first. We made it clear that they could talk to us anytime, about anything, ask any question. ES: A friend started a “Helping Hands” Facebook page, where people could sign up for meals, rides, etc. She didn’t let me be part of the group, which was essential, so if someone I know well didn’t volunteer for anything, or someone had to change plans or cancel, I’d never know and they didn’t have to feel badly. She also laid down some firm ground rules that helped a lot – like leaving meals in a cooler on my porch so I didn’t have to make small talk or talk about how I was feeling with anyone at the end of the day – the meals were dropped off and the person left, which seems cold but helped a lot, because I was spent at the end of the day. ES: “Don’t go there until you get there.” I’m a worrier, an awfulizer, and I had a hard time keeping it in the moment. Waiting for test results was the worst,and my crazy brain had me picking out what I’d be buried in when the phone would ring with the “All clear” or “We need to biopsy” – once I knew the plan I was okay, but the waiting was the worst. I had to work hard to finally understand that being anxious only ruined precious minutes, hours and days, and it didn’t change the outcome one bit. ES: Find your safe people. Find the people you can fall apart in front of, who you can be totally honest with, who will understand some days you just need to vent your fear. We’re hard-wired to be “okay,” and I’d find myself actually comforting other people who just needed me to be okay (and these people are sometimes the closest to you – in your family or close friends). So find support groups, cancer boards, websites, or other survivors or patients to talk to… people who truly get it. ASK FOR HELP. It’s so hard, but when someone offers to help, have an answer for them – like “I need a ride” or “could you please cook a meal” or “can my kids have play dates at your house now and then.” Let people help. You’ll need it, even if it wounds your pride (it certainly did mine). PWC: What’s been the hardest part about having cancer/cancer treatments? ES: Being a “go-getter” – someone who is the one people turn to for help with all sorts of problems – a creative person who runs my own business – a mom who wants to be part of my kids’ activities – and then having to be the person who needed help, who had to let family, friends and sitters take my kids to activities, who had to just STOP, REST and HEAL. I was a terrible patient at first – when I was starting to feel tired and sick but not SO tired and sick that I couldn’t get out of bed. On those days I tried to do too much and I always paid for it. Now, looking back on it, it can actually be a freeing time, to have to focus on self-care. I learned that putting myself first isn’t selfish, it’s necessary. “Put your own oxygen mask on before assisting others” – that type of thing. Now even post-cancer, I’m still prioritizing self-care, and it’s made me a better mom. ES: Making sure they weren’t around sick, tired, sad adults too much. I filled their days with playdates, kids their age or fun sitters they loved. It’s tough on both the patient and the spouse to have a “game face” on for the kids (and they can totally tell, anyway, if they are old enough) so making sure they had plenty of “kid time” helped a lot. I also tried to have ‘snuggle time’ every night- no matter how badly I felt – just a touch base and many “I love you’s.” I made sure they didn’t think it was their job to take care of me – that I had other adults for that. I answered any questions honestly, but only answered what was asked – I found that if they asked the question they were ready for the answer, but if they didn’t want to know, they wouldn’t ask. ES: Now, in remission, it’s the thought that you don’t ever really get to check off the “cancer box.” It’s my new normal – scans, check-ups, the idea that it could, some day, come back. I meditate, go to a cancer yoga class, attend group therapy and see an oncology psychiatrist to help me adjust to my new normal. In some ways, it’s more stressful than being in treatment – or it would be, without all the help – because you’re in that waiting period again. But getting that help has made all the difference in the world, and I’m not up nights much anymore. 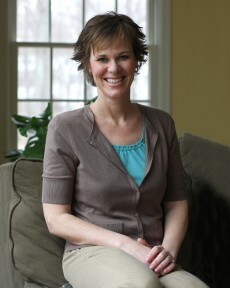 ES: I loved www.blogforacure.com. It’s a website that has lists of all sorts of cancers and you set up an account where you can “blog” – but it’s more like just a place to ask questions, share stories, etc. with people who have your exact cancer. I also wrote about my cancer experience on my own blog, and a cancer community found me that way – so many resources I can’t list them all. But certainly reading others’ stories – whether it’s books or blogs helped a lot. I only read “survivor” books, though, while I was sick. It was all I could handle. ES: Spending so much time living in fear and anxiety. It takes practice and so much work to learn to pull it into the moment, accept life on life’s terms (even when it doesn’t seem fair. Especially when it doesn’t seem fair). Now that I’m figuring out how to just be – with a lot of help – and when I start to lose myself to awfulizing I realize that it’s my fear talking. It pulls me away from my kids, from my life, and it doesn’t change the outcome at all. So I better enjoy the life that’s right in front of me while I can. PWC: What else would you like parents with cancer to know about you and your experience? ES: TALK TALK TALK. Don’t hide. I know many people feel really uncomfortable talking about their cancer – I totally get it – but find other patients and survivors, or read blogs and post anonymously – keeping it bottled up adds so much stress and isn’t good for your healing process or your sanity. In my humble opinion. Thank you for being so honest in all your comments. 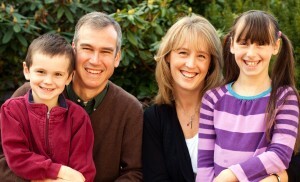 My children were 7, 4, 21/2,and 5months when Steve, my husband, found out he had cancer. He fought hard for two years, but the disease took him from us when he was only thirty. It wasn’t easy being such a young widow, trying to explain all that happened to such young children. But we got through it and they’re raising beautiful children of there own. Thank you and this is an inspiring blog! Thanks, on a related note, Some Chromozones we get from out parents may be damaged.Is this damage that really leads to cancer.Chromozone 17 is one example.Some genes within Chromozone 17 like p53 may not be working properly.I believe some kind of chemical interference damages parts of certain genes and we then pass theses damaged genes onto our children without knowing.Can some genes be replaced or repaired.Can you receive genes from your parents,brothers or sisters without a immunity response from your body. Alcoholism and tonsil/throat/oral cancer go hand in hand. Were you really that surprised? I truly hope you stay in remission-both with your cancer and your alcoholism. You have kids-stay strong for them. I have a friend who is a bona fide alcoholic and it is horrible to watch the denial and the poor parenting that results (she has a 3yr old).